Park & Ride is always a hot topic of debate, being seen by some as the key to get more people on public transport. We believe the issue is much more complex, in large part because they take up a lot of land, cost a lot to build and don’t provide all that many extra trips. 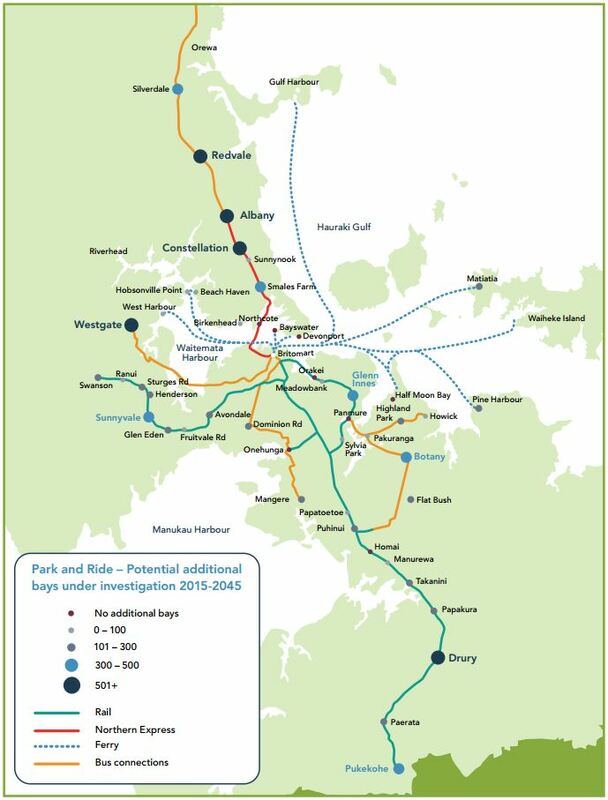 Despite this, Auckland Transport have long had a desire to significantly increase the number of park & ride spaces in Auckland with their Parking Strategy calling for 10,000 more spaces over the coming 30 years. For comparison, Auckland currently has about 5,500 P&R spaces with most at Albany (1,100) followed by Constellation (370). AT’s Regional Land Transport Plan (RLTP) does set aside money for P&R but it’s won’t provide enough to meet ATs goals. So it was interesting last week to read they’re looking at some new ways of funding P&R. Auckland Transport is considering a $1 billion plan for thousands of apartments to be built above park and ride sites and bus stations. The agency said the government’s Kiwibuild programme could be a catalyst, providing homes for key workers and helping to fund thousands of new park and ride spaces. Consultants PWC have already given a tentative thumbs up to the concept of building three levels of apartments and a multi-storey car park at Papakura railway station. Documents sought from Auckland Transport by Stuff show the agency is working with fellow council arm, Panuku Development, to assess the market potential of the land. Early ideas include creating a new entity with commercial goals to deliver the developments, manage parking revenue and eventually pump funds back for infrastructure. The work has the dual purpose of generating revenue for only partially-funded plans to add 6000 park and ride spaces, while also putting more Aucklanders close to public transport. AT should probably be applauded for thinking outside the box but that doesn’t make it a good idea. It would make those who are prepared to live at a higher density close to a train or bus station, an outcome the city wants more of, subsidise those who aren’t. 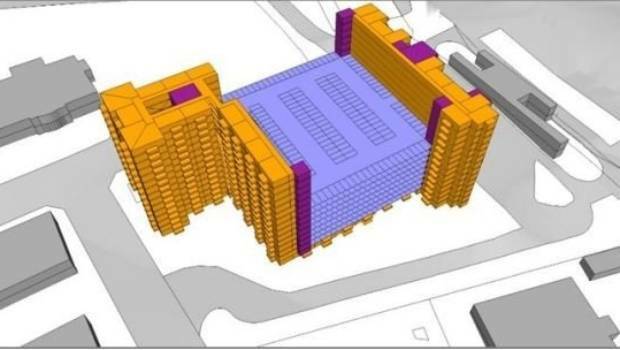 For example, the article mentions that one of the most dramatic proposals is for the Constellation Busway Station that would see 15-storey buildings containing 359 apartments built, along with an extra 629 carparks (bringing it to 999 spaces). But that would mean each apartment owner will need to pay at least $87k, probably more, on top of the cost of the apartment itself just to pay for a carpark for someone else to use during the day. As well as the financial cost, those living in those apartment would need to put up with all of the noise, emissions and local congestion caused by people accessing the carpark. This wouldn’t be the first time we’ve mixed housing and podium carparking next to a station though. 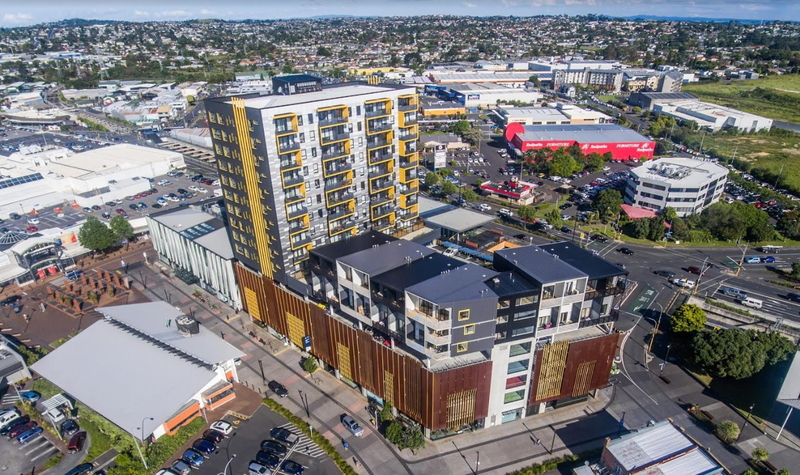 The most prominent example already in Auckland is in New Lynn where apartments and townhouses have been built on top of a 4 storey carpark – some of the spaces are reserved for residents and some for the neighbouring medical centre. Before any of this happens though, the first step needs to be that AT start charging for P&R. Doing so would give a better feel for just how much demand there is for more capacity and can also help financially contribute towards the construction of that capacity. It beats me why people in places like Albany – that are quite often full quickly – don’t just park down the road and get one of the many feeder services, it doesn’t cost extra thanks to integrated fares, plus it drops you off right at the bus station, no need to walk up a hill of carparks. I guess if they don’t waste money subsidising park and ride users (to the tune of $25/day or more), they can put that money into more feeder services. I don’t think the subsidy is as big as that – maybe $5-$10, depending on how you calculate it – but it’s still pretty substantial, and AT can get much better ‘bang for buck’ and higher patronage by investing in improved services instead. -the traffic the park induces: extra roading costs, dissuasion to walk and cycle therefore public health costs, climate change, deterioration in air quality therefore public health costs, traffic violence therefore public health and social costs. How do you get to your figure of $5 – $10? Peter N – this is a good point and AT could easily highlight it. Produce maps of the feeder services to stations that show the approximate number of free on street parks within ~100m of stops. Use this to demonstrate that there is an existing alternative to park and ride at busway stations. Short term – immediately price existing park and ride space to encourage people to use the feeder services. Longer term develop existing park and ride surface lots into TOD housing with very minimal parking – perhaps only carshare. Rural areas on the other hand, I am all for, as you probably cant deliver so much in the way of feeder services… but these should generally be well outside of the urban area. Feeder only works if it is frequent, fast and has long operating hours. At the moment this is not always the case. Some connector service in the new network is one bus per hour with indirect slow route and has no service at night. For feeder to work the residential density needs to be much higher. That may be the goal. However before we get there, we should think of new technologies. The shared electric scooter scheme or autonomous on demand shuttle may be more suited for Auckland low density suburbs. I’d imagine in the areas with low density, they’d be struggling to have any footpaths at all, given the number of hundreds of outstanding requests AT has for them. Let alone footpaths suitable for scooters. What we most definitely shouldn’t be doing is building more suburbs that have the same problem of insufficient numbers of residents to support the bus network. And the worst thing we could do is spend the bulk of our transport funding providing extra road capacity for such suburbs. Yet that’s exactly what we’re doing. If we are to point the finger at the source of the problem, this is it. Anything to do with parking is a market distortion if it’s not priced according to demand. As such, I fully agree with the article’s conclusion that before anything else is done, charging of existing P&R must happen first. The alternative way is to sell the carparks to users and investors. So it doesn’t cost council any money. The owner can use it themselves, or rent it out to other user who is willing to pay. They can also rent it back to AT, who manages it and collect parking fees from casual users and pay it to the owner minus a management fee. I’d go further and say we must, for the sake of the people who live there and don’t drive. If people want park and ride because feeder buses are insufficient, where does that leave the pre-teens and the teenagers? People with impaired vision? Those who have given up driving because they find they’re not quick enough for the aggressive driving culture? Subsidising park and ride users at the expense of providing sufficient feeder buses means, as usual, these citizens are missing out. Waiukuian – Te Kauwhata and Pokeno is comes under the Waikato Regional council not Auckland Council. Waikato Regional Council is developing its on PT strategy for the next 10 years. The regional council is looking at having the Pokeno railway station reopen for the proposed Tauranga/Hamilton/Auckland regional rail services and to improve bus to/from Pokeno. Surely the places that need more park and ride spaces are on the edges of the network, where people drive in from areas that aren’t served by PT… These are also the places where building apartments makes the least sense. I’m all for building apartments around and on top of PT stations though. I’d happily live in one, so long as I wasn’t paying extra to subsidise someone else’s parking space. Most international TOD PT stations has retail, office and residential on top of it. Good idea. And having a sports ground at a transport node makes good planning sense, too. Very smart! I think people tend to discuss transport projects in isolation of the rest of the urban fabric, but they’re not. The parking still needs to be priced, but by doubling up the uses like this, that cost can be shared further, putting it more in line with what our population thinks is reasonable, after so many decades of having highly-subsidised parking. They need to provide much more secure last mile transport storage. Perhaps if there was people would be more inclined to cycle or use scooters to get to stations. There will always be people that want to drive but there isn’t much alternative for non car drivers other than feeder buses which aren’t suitable for everyone. Here in Wellington there is a 1.5 – 2 *year* waiting list for the secure bike parking at the central railway station – clear evidence of surplus demand – but there are no plans to build any more. There’s no bike storage at many Auckland suburban stations beyond 2 or 3 staples, and I can’t see any evidence of secure bike parking (or the ability to take bikes down escalators to the trains) for the new CRL stations. There should absolutely not be additional provision for cycle access at K Roador Aotea. It’s going to be far too busy in the peak and off peak the access by the elevator is perfectly adequate. At other stations we need literally 100 times more parking and much more secure parking. We need more secured bike and scooter racks. People should have a right be bring the bike to train or bus. Also AT should have a more proactive role that requests Onzo and Lime to redistribute enough bikes/scooters outside of train stations every night. I’m not sure why everyone can’t see the congestion around the park and rides on the northern busway, and how it holds up all the movements, of cars and buses using the local roads, using the on and off ramps, going to the station, and so on. Parking at the transport nodes should be kept to a minimum; it just makes the transport network sub-optimal for all users. I agree with the comments above that it’s a good idea on the periphery of the city. Having lived, worked and travelled by both car and bus through and around these stations I really don’t know what you are talking about! The congestion surrounding these stations has nothing to do with park n ride and everything to do with other traffic. Take Albany for example, the traffic is people going to the mall and driving through the area to get from the north harbour industrial estate and Browns Bay etc. Constellation is a mix of motorway traffic, and traffic from out west heading to/from the shore for the offices in Rosedale area or houses around Mairangi Bay. If I move into an apartment one day, I don’t want the building to be surrounded by car movements making walking unpleasant and dangerous. On the northern busway, careful design would be needed to shield the area from the motorway anyway, the ‘other’ directions need to be people-friendly. If AT are serious about ‘sponsored infrastructure’ and other sources of nonfare revenue for capex and opex funding, developing Park and Ride locations like this is definitely NOT the way to get results. As other transport agencies have proved overseas (2006-2016 era MTR Corporation is a good example), 1. Form a dedicated real estate development unit generating income that is not earmarked for any specific project expenditure other than for funding more building developments at stations and interchanges – reinvest in the business, not simply transfer money into the agency’s main accounts. 2. Include minimal parking (no more than 40 spaces, all chargeable by the hour) at each development location with focus instead on connecting bus services. 3. Every development to be mixed use and each development to be based on the surrounding community’s particular requirements – some developments will have no apartments at all, just a supermarket, a medical clinic and a childcare centre for example. Doing land deals to fund an inefficient and congestion-inducing mode of transport like AT are planning to do, is not only dumb, its mind-numbingly stupid. If you want to make money and keep making money, do it properly as outlined in the above points 1, 2 and 3, otherwise dont do it at all. I agreed the new buyers should not subsidies the public park and ride. However I do think building apartments and privately owned car parks on top of train stations is a good idea and should be encouraged. A compromised way is to leave the same number of currently free carparks free at a first come first serve/ or free off peak. Any additional car parks built will charge a small parking fee, the collected revenue can be use to payback the building cost. Why is that necessary? Why not just start charging people now? So the solution is to keep the old one free, but charge the new one. What level of public education has AT provided on the subject, Kelvin? If AT don’t provide the information on the topic, they can’t expect the public to make choices that are equitable. If they don’t price the different options according to cost, people can’t make choices with their feet. You’re happy to let ‘the public decide’ without the public being charged for their unsustainable activities and without understanding the level of subsidy involved, and who in society is missing out? That’s neither market forces nor democracy in action. Some free and some not will merely encourage the existing mentality that “free parking” at transport nodes is a absolute right, so when they can’t find any free PnR spaces in the free part they’ll just clutter the streets up like they do now and the newer pay parking will sit half empty. Better to charge at least the same rate for all parking at a PnR to stop the first in best dressed/free for all behaviour and finally get people used to paying for parking just like they pay for the PT. The only thing stopping AT from doing so right now is that they want folks to use HOP cards to pay for it. But you don’t/can’t pay with HOP for parking in other AT owned parking buildings anyway so why not just put Pay and Display or pay for parking before exit machines/barrier arms in them like they do in other parking buildings. The paying step should come before anything else [even before providing more parking]. Those in a position to get to an existing PnR before it is full not wanting to pay for it isn’t a good reason. Public consultation was hardly going to get any other result by number of responses, was it? Did they survey those arriving at potential sites by bus to ask if they would like a realistic option to pay for PnR (for occasional rather than regular use)? If the planners in charge of station/interchange development dont keep their wits about them, this ‘rush’ to address ‘the housing crisis’ and make a quick buck at the same time – to fund a transport mode that is the root cause of urban sprawl and community severence, is going to result in a series of sub optimal outcomes in Auckland over the next 5 years Successful TODs and PT node-connected housing developments arent built around cars and commuting, they’re built for providing ‘real convenience’ for people and the communities they are part of. Just ask anyone living in an apartment above a station in Singapore, Kuala Lumpur, Hong Kong, Hangzhou, Shanghai, Seoul, Tokyo and Auckland’s sister city Fukuoka – they dont need nor want to own a car as everything they need weekdays and weekends is right downstairs….and by the way, I’ve visited or lived in such apartments in these cities and they sure as hell aint shoeboxes. Agree with this article 100%. Great idea thinking of developing the land, but yes, without charging for the parking, how on earth do they know if there is proper demand. Taakanini Train station – there is a church with a large car park right next to the train station – this is empty Mon-Fri. Yet AT is spending how much on providing a park and ride at this station. Papakura Local Board seems hell bent on building a multi-level park and ride building. Seems an insane waste of money. Especially when rural areas between Papakura and Pukekohe will be served by new stations (which can then these station can have a park and ride provided as they’ll be serving rural areas). Is that New Lynn example the building that had random columns in people’s rooms that were not on the plans they had bought from? Probably a bit stupid for not thinking that their view from the fifth floor of a building in a metro centre would get built out. Yes it was. The architects who designed that block should be named and shamed. I’d keep well away from anything they are involved with. I think AT have lost the plot to be honest, or given up on actually getting people out of cars. Have they modeled this on any other similar sized / laid out City? I can’t imagine any other Cities with 1.6m residents would invest so heavily in P$R so close to the CBD (constellation). Essentially, parking a Constellation for FREE is just a free work car park. Today’s Herald reports that we currently have a glut of cars. This means some dealers will be under cash pressure, prices will drop especially for second hand cars and this will be an incentive for people who really can’t afford a car to take to the road. I don’t think this is really a good thing for a desirable city in which to live. I don’t agree that we should charge for park-and-rides. They are there for people who don’t have public transport services, such as at the northern, western and southern fringes of the city. They are a legitimate enabler of public transport for these people, and if anything they should be included as part of the fare if we ever get integrated fares in tis city. Have a look at the map, David. They are throughout the city, in areas with existing public transport options, and the majority of people using the stations do not use the park and ride. All the park and ride does is make getting to the station worse for all these other people, whether they arrive actively or by bus, and it takes a whole lot of funding that would be better spent on improving those modes to the station. It is the worst way to subsidise our public transport. For the stations that are legitimately on the city – rural boundary, those lifestyle blockers can be expected to pay for the parking – it is a privilege of have both city and country living as an option. But the park and rides soak up so much money that could be used on improving feeder bus services for those people. What is the best value for money? Yes I would think more feeder buses in urban areas, and park-and-rides on the fringes, would probably be the best value combination. For example Glen Eden is the nearest station for anyone living in the Waitakere foothills, but there are no associated feeder bus services and it isn’t an easy proposition for AT to provide them due to low density. I would argue that park-and-ride is a valid option in this case. Just because people live in these fringe areas doesn’t mean that they should be excluded from public transport. We want people off the roads and onto buses/trains/ferries (especially for long commutes) and park-and-rides are probably the cheapest way to do it. I agree, but at the same time just because people live in low density fringe areas doesn’t mean they should get special treatment either. The problem comes when serving one of those people with a park and ride building ends up costing ten times as much as serving a resident in a less far flung neighborhood with a feeder bus. There is no reason we should spend ten times as much money on resident A as resident B, just because resident A chooses to live on a lifestyle block or a bush bach beyond the suburbs. An able-bodied, fit friend of mine lives a 15 min walk from the Sylvia Park train station but instead drives 5 minutes to the Panmure station P&R instead. I doubt my friend is the only one doing this. And it’s only because the parking is free. There are probably people who arrive at the P&R later who would be willing to pay to get a space but can’t because all the spaces are taken, some by people who really don’t need to use the facility. Pricing parking would sort this out. Are the HOP cards linked to people’s addresses? If they are or could be then there is a possible solution. If you live within 400 metres of a bus stop for a feeder bus and decide to drive to the park & ride then you get charged a decent amount to use the park. If you are not close enough to public transport then you pay a nominal charge(maybe a one zone fare) or maybe no charge. That would make it more likely that those who do not have viable public transport options near their home will more likely be able to get a park and encourage those that do have options to use the feeder buses. Books about parking management go into detail about mechanisms like these to ensure the parking goes to those who need it most. I was left with the impression that people always play the system. Better is to plan properly, with a good network, and small amounts of priced parking. Wouldn’t it be better to build office buildings above the park and ride instead of apartments? Then you can subsidise the car parks with the office leases. That should have the added benefit of helping to decentralise Auckland, which in itself is a major contributor to congestion. Constellation already has a Business Park next to its Park and Ride, would be interesting to see if there was actually demand for offices. Albany…well they could build anything there, such is the amount of land available. I do find it hard to fathom that in the midst of a housing crisis places like Albany (new Albany, not the village) have hectares of nothingness and only 1 apartment complex of 5 levels is going up. FFS. Council planners, what are you doing? You have free access to the latest parking management books in the Corporate Library that the rest of us have to pay $5.20 to borrow. How about you make use of that privilege, and learn some of the basics! I imagine if there was demand from companies to be located above Park N Rides then I imagine AT would have allowed developers to do this, I don’t think there is any zoning that restricts it. I imagine that companies would prefer to be located on sites that don’t have to “subsidise the car parks with the office leases”. I imagine that would depend on whether the subsidy comes out of the profits rather than being added as an additional cost. Same thing in the end. Just the basic observation that during peak travel times the roads, buses and trains in one direction are packed and sparse in the other direction. Maybe there’s a study to show that having over 10% of the total Auckland work force working in an area 1.67 square miles will cause a significant bottleneck, but I’m not sure it’s necessary. Worth looking at the studies, Nick. You don’t get to low vkt/capita through decentralisation. You achieve it through people-friendly medium density over a big central area, where population density supports good public transport, and where good active mode infrastructure provides plenty of the transport needs because things are close enough together for it to work for the majority of people. Of which more than half doesn’t drive… the side effect of agglomeration, much reduced traffic. If you look at the data on, say the Harbour bridge, the majority of traffic crossing it is not going to the central area, but across town to other centres and suburbs. That is the effect of decentralisation, more traffic driving very long distances right across the region. Weekend and Night Time activites belong with Park N Rides….not places like Albany Bus Station which is nowhere useful. For example Takapuna’s carpark development would make an excellent Park N Ride because weekedays would see it filled with commuters but evenings and weekends would be full of shoppers and people visiting the beach. It will really help to pay for the investment having paying customers outside of 7am to 6pm. Wilson and Tournament can’t be as wealthy as they are for no reason! Furthermore, locating Park N Rides next to centres will make the buses frequent those centres, too. What are you taking Ak-Sam? “evenings and weekends would be full of shoppers”. Takapuna shops don’t open at night.They do open during the day and the purpose of the car park is not to provide for commuters but to provide space for shoppers. You need to look at the AT Parking Strategy to see how AT are supposed to provide for parking. If people are so fussed about parking fee, we could have ‘customer’ all day parking. For example we could also build a supermarket / food on the ground floor. If people spend enough money on the supermarket or restaurants, the parking will be free or heavily discounted. What actually happens is the supermarket instead of just renting the retail floor area, they also rent the carkparks together in the lease. The supermarket can decide the parking policy. But Kelvin, then the people who arrive at the supermarket are paying higher prices so that the supermarket can provide free parks. That’s mad. They don’t have to shop at that supermarket if they don’t need that car park. I will see that as a ‘convenience’ fee. Right, because the people who are not driving are the ones who can most easily just go to another supermarket. What the dickens is wrong with introducing charges to inch towards people paying some of the costs of their use of resources? And using it to nudge people away from damaging habits to sustainable habits? Haha, every imaginable way to make some revenue for P&R other than charging for it? Why if there is such a demand for Park and Ride have other Car park operators not popped up in the vicinity to ease this demand? Do they suspect that people only use it for the total convenience of free parking with a short shuttle into the City and if they had to pay would get a feeder bus or active mode to the station? Surely land around these areas is much cheaper than the land they cling onto for surface car parks in the CBD? If the market demands parking around these Transport hubs because there really is no feeder service then surely the market would supply it? i do not see why I should pay for other peoples parking thru my grocery prices because I walk to the supermarket myself. That prime real estate is not free. Just a reminder that AT’s park and ride on Waiheke (Matiatia ferry terminal) has charged for parking for years and has just increased the cost…presumably to manage the demand. Here’s hoping they spend the increased revenue on improving the feeder bus services. Park and ride in he centre of Papakura doesn’t make sense. Park and rides at Te Hihi and Clevedon do with frequent bus services from there. We need to make allowances for more lines through Papakura to the south as well so I assume they will be provided for under the building. Also, remember that Papakura station is on a fairly deep layer of peat. Finance the park and rides from parking fees adjacent to stations which should be greater than the fares into the town + say 20%. The inconsiderate parkng n the areas of the station are a disaster for those using the town centre. We need shorter time periods on the parking spaces near to the stations. Takanini station needs much better facilities for the bus users to transfer to train and shelters at those bus stops now! The walking from bus to station needs to be looked at and made a priority over the present parking! That tower sticking out of New Lynn certainly is a carbuncle worthy of a place that allowed such a monstrosity to be built. Given that the station sits within a trench; why not cover the top of that trench with a low-rise car-parking building (accessed with a hop card)? Or maybe cover one side with a bus stop? Because a standard carparking building costs around $50,000 per space to build. A low rise carparking building cantilevered over a railway trench might cost double that. You’d have to charge $30 a day per space to break even. Your source for that would be this would it? “I’d better start with a disclaimer: I’m an economist, not a quantity surveyor, and the figures I’m using here are just for discussion purposes on this blog. Costs can vary widely from project to project, and if you want a detailed cost estimate, you need to talk to a professional in that field.”? “Then you add in professional fees, finance costs, local authority costs and contingencies. These costs might come to $150-$300 a square metre, depending on the type of parking. Oh, and all of the costs above exclude GST, except for land costs where it tends to be factored in already. For your construction costs and all the other associated costs, you can add GST on at 15%. Overall, the cost to build a carpark in a basement, or in a multi-storey building, can be between $30,000 and $50,000 (or even higher) once everything’s accounted for and GST has been added.”? Are you being deliberately misleading or are you ever more low-IQ that I realised? For starters; there wouldn’t be any land to purchase…. Over what time period? Who said it needed to break even in any near timeframe? This project would be more about attracting more park-and-ride commuters…. My source is myself, having planned multi-storey park and ride buildings in my job. Yes it is a guesstimate, I’ve not had the pleasure of designing and costing a parking building over a railway trench in New Lynn before. There would be land purchase, the land and it’s air rights are owned by Kiwirail who have a policy of charging market rate for all land sales and leases for any reason. Notice how all our cycleways are built in motorway designations and not along railways? That’s because Kiwirail charges and NZTA doesn’t. $30 per space per day indefinitely, no timeframe. Assumes a 6% discount rate, plus 2% opex per annum, with a renewal at ten year intervals and full depreciation over 40 years. The new Takapuna carpark has just started and costs almost 60k per space. It was also popular off peak with the bus leaving people behind at Smales station at 1130 due to a full bus. The park n riders may be people who hate the hastle of a connection. I see ITOs place as an additional service in a busy network ( such as North Shores) . It takes pressure off hubs due to being quicker getting through , avoids congestion for no loss, adds to connectivity, and is more efficient in using bus time. The only down side is additional complexity but my guess is peak time bus users on the North Shore are a pretty intelligent bunch. Noone in my capainging for more 871 buses asked for a simpler network. ahh can you clean this please!! On the assumption that congestion tolls are eventually implemented in Auckland, park n ride sites are a critical component of a multimodal transport system that allow users to optimize their travel and mode shift to PT across the congestion toll cordon. Where there is excess demand for park n ride, the parking spaces can be charged for. How would we know when there is excess demand? We don’t measure the parking demand. Parking demand is defined as the occupancy rate under market conditions. So first, we must price the parking that’s there fully. Next, we decide if they’re a good idea. I imagine the best design would have priced parking at a km or so from each station, with regular shuttles included in the price of the parking. It’s important the cars driving to the parking don’t interfere with the transport network. Currently they stuff it up completely. Sorry kiwi, why are park n rides a critical component? I presume you are saying that because AT wants to build more spaces at Albany they should be charging for existing space? And if it fills again they raise the price again? And with more demand, again? I think that is a great idea. I struggle with park and rides on so many levels. The first is that regardless of whether you live 50m from the park and ride, or 50 km you can park there for free. Further, why if you choose to live some distance from a PT station should you be provided with free parking. This encourages behaviour that is directly contrary to what is useful and that is more driving. The most cost efficient mechanism is to have a toll on the main thoroughfares to prevent long journeys. It works in places like Santiago do Chile and Sao Paulo where there are not endless dollars available to spend on transport projects; odds are it will work here. Because its financially unsustainable to provide feeder bus services at a LOS viable to service the full park n ride catchments. Yes, I agree, park n ride should ideally incur a parking fee as I noted “Where there is excess demand for park n ride, the parking spaces can be charged for”. Without congestion tolls in Auckland currently it is more difficult to charge for p n r.
If you don’t provide feeder bus services at a LOS viable to service the areas feeding most of the pnr locations shown on the map, you are committing non-drivers in a huge swathe of Auckland to dependency on other people driving them. Do we not care about these people? Let’s not confuse provision of a small amount of priced parking to cover emergency situations, and provision of pnr on the true outskirts of the city, with AT’s hugely subsidised, urban form-ruining, car dependency-exacerbating park and ride plans. What AT has planned for the city is not a critical component of a good transport network. Charging for Park and Ride, combined with the very high fares AT charges, will simple see people deciding the economic calculation between the convenience of their own car and PT swinging back in favour of their cars. If it was cost and more or less time neutral, most people would take their cars. With the cost of petrol as it is, I think it would have to be a fairly substantial charge to force them back into their cars. And that’s before we talk about feeder buses as a cheaper option. Given they are basically full now (at a price of free) as I understand it, and you price them to be near-full, I don’t see the issue with pricing them? Unless you end up replacing peak PnRers with shoulder PnRers, which seems unlikely, you don’t change the amount of peak traffic as a first-order effect, and additional spending available for more efficient modes is a positive second-order effect. +1, this is concern trolling. As you said, if the park and ride is currently full, and the charging prices it to full minus 1, then one passenger is lost. However, if it is charged hourly, then you may increase patronage by discouraging people going to the city for a 10 hour day and encouraging those going for a single meeting (or lecture). More different cars would occupy them during the day. I get that. Instead of one park and ride commuter, there could be several park and ride short-term visitors to the city. I get that. We don’t need to discuss what happens to the person who used to use the park all day. What I’m not sure of, is what the people who now use the park used to do. Were they nudged from driving all the way to town, to using the park and ride and bussing? Or were they nudged from using the feeder bus to using the park and ride? Somehow missed commented on this post. Yup sure need to charge for these P&R’s & restrict to rural catchment type areas.